This unique style of artwork is inspired by nature. The gourd is one of nature's greatest treasures. Since the early 1700's, gourds have been used by many cultures for a vast array of purposes. Gourds grow on vines and harden over winter to a hard, wood-like texture, making them ideal to use for containers, utensils, storage, musical rattles and beautiful decoration. Gourds are classified as a vegetable and are in the same family as cucumbers, squash and watermelon. They require at least 120 days growing season to mature and then have to dry for up to a year before they can be used. The artist uses many different types of gourds for her designs, including native gourds, birdhouse, bushels and bottle gourds - just to name a few. After cleaning and sanding these harden plants, the artist uses wood burning tools and stains to transform them into beautiful pieces of art. 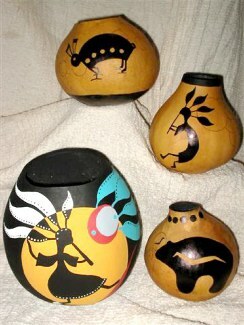 All designs are freehanded onto the gourds, then using acrylic, oil or ink, the artist brings the pieces to life. 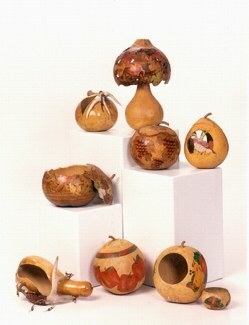 Each gourd is professionally finished for a one-of-a-kind creation. The gourds are a beautiful form of art that can be designed to suite anyone's taste. They can also be used as Christmas Tree ornaments, useful containers, potpourri holders, decorative baskets, bread warmers, onion or garlic holders, flower vases and more!